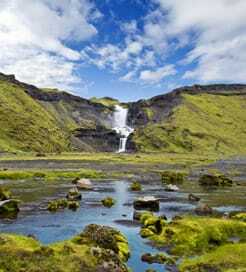 Iceland is a Nordic country and the most sparsely populated in Europe. Covering an area of just under forty thousand square miles between the Arctic and North Atlantic oceans, Iceland is home to just three hundred and twenty five thousand people. Iceland is volcanically active with many geological marvels - the northern lights, geysers and mountains, lava fields, glacial rivers that flow down to the sea and hot springs that supply much of the country’s heating. By ferry you can travel from Hirtshals in Denmark and Torshavn in the Faroe Islands to Seydisfjordur in Iceland with the Faroese ferry company Smyril Line. The ferry sails once a week between April and October and gives you the option to take your own vehicle or alternatively to travel on foot. The crossing from Denmark to Iceland is long and quite expensive, however the ship used by Smyril Line is of cruise line standard and therefore the time spent on board more than compensates, hence the popularity of this route. Ferries dock at Seydisfjordur port in the east of Iceland and if travelling by car then you link up with the rest of the island via route 1, or the ring road which runs around the island connecting the major cities. Many of the most popular tourist destinations are within a short distance of the ring road. Though Iceland has no railway system, a large network of bus companies cover most destinations in the country. There are some incredible natural phenomena to visit in Iceland. Whales can be seen from various different places in the country and whale watching tours are popular, as are tours to visit the many geysers, underground springs and thermal pools around the island. Landmannalaugar is popular, with its otherworldly landscape of lava fields, as are the multi-coloured rhyolite mountains and the Hekla volcano. Skaftafell Ice Cave and Vatnajökull National Park attract many visitors in the winter to view the ice caves and glaciers. Grindavik Blue Lagoon offers visitors the chance to bathe in a geothermal spa, and of course, the famous Northern Lights or Aurora Borealis can be viewed in more remote locations from the middle of September to the middle of April. City life also has a lot to offer in Iceland, with beautiful architecture to be found in buildings such as the Hallgrimskirkja church and the Harpa Conference and Concert Centre. Iceland has a cool club and bar scene - the locals know how to party, and you can find schnapps made from fermented potato mash to help you get into the party mood. For more information, please visit our Ferries from Flatey Island to Iceland page.